This is a 1:25,000 scale map of St. Pierre, France, prepared for the purpose of Operation Totalize (August 8-9, 1944). It is a defence overprint published by the Geographical Section, General Staff (GSGS) of the War Office of Great Britain on August 6, 1944. 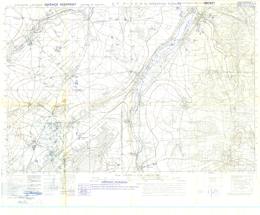 This overprint was referenced from air photographs taken July 31, 1944, counter-battery sources taken August 3, 1944, and ground sources taken August 5, 1944. Production information for the overprint is 2010/8/44/3RCE/5028.